What happens when raging punk rock musicians get older, with families of their own? 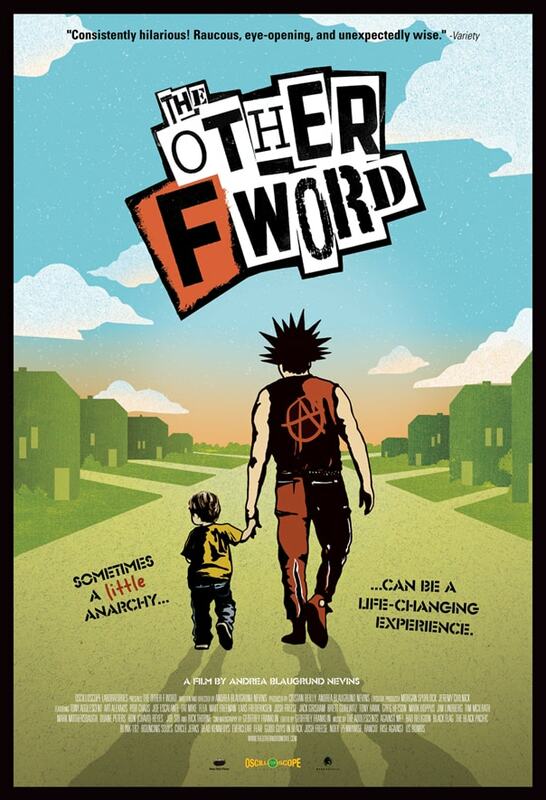 The Other F Word explores this intriguing question, rightly earning itself a special place among the best rock ’n’ roll documentaries. Punk rock is a product of rage and rebellion. Disaffected youth use it to rail against the machine of society, hoping for change through the anarchy they represent. But nobody is young forever; so what happens when the tattooed, mohawk-sporting mavericks of music have to trade drums for diapers and concerts for carriages? Will they buy censored versions of their own CDs to shelter their children from their own obscenity? This intriguing question is explored in the surprisingly affecting The Other F Word, which earns a special place among rock ’n’ roll documentaries. Among the many hilarious contrasting images are stars like Flea of Red Hot Chili Peppers and Mark Hoppus of blink-182 scolding their offspring for mild obscenity while their nightly performances are filled with much worse. We also see “normal” families clearing a playground when approached by a pierced and tattooed dad. It’s hard for the rockers when they have to fight the personae they’ve worked so hard to build, and what emerges is a very touching commentary on fatherhood and compromise. The Other F Word deflates the myth of the eternal rock star lifestyle. Even some of the most irascible and unruly figures have had kids and settled down eventually. In a world powered by youthful energy, familial responsibility and unstoppable maturation take over. More than one of these famed macho men break down in tears as they relate the pain they experienced with their own fathers, an undeniable influence on some of their discontented art. The experience comes full circle when they realize that their own good parenting could eliminate the problems that pushed them down some unsavory paths. And they will not let their children down.